With the NASCAR Sprint Cup Series in Kansas City this weekend, championship contender Tony Stewart is getting a head start on the weekend. Stewart, who is sponsored by Office Depot, is joining the Office Depot Foundation this afternoon to donate more than 2,200 backpacks to Kansas City-area nonprofit organizations and schools. The “Back-To-School Backpack Celebration” takes place on site at an area Office Depot store. The backpack program is a cornerstone of the Office Depot Foundation. 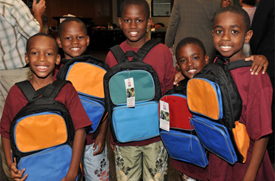 The organization will have donated over two million backpacks by the end of 2009. But it doesn’t stop with backpacks. The five areas include: Helping children get ready for life and work; Helping non-profit (civil society) organizations become more professional and productive; Enhancing disaster relief and recovery; Strengthening local communities; and Promoting global development (a href=”http://www.officedepotfoundation.org/index.asp”>Office Depot Foundation).